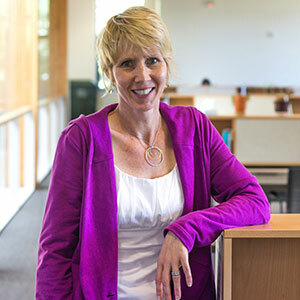 Kathy Gunter is an associate professor of Exercise and Sport Science and Extension specialist with Extension Family & Community Health at Oregon State University. She was recently named the Healthy Lifestyles and Obesity Prevention in Children and Families core director in the Hallie E. Ford Center for Healthy Children and Families. Previously she worked as a faculty research associate and instructor in the former Department of Exercise and Sport Science in the CPHHS, and as an instructor in Public Health. She is a proud Oregon State alum, who received her Ph.D. in Human Performance with a Public Health minor. What made you decide to get into this field of study? Is there one specific moment that inspired your career path? “I’m still working to promote skeletal health through physical activity, but the focus of that research is more about evaluating evidence-based programs such as Better Bones & Balance that have evolved from the research. We know physical activity is good for bone, but have we constructed programs that enable anyone’s mom, dad or grandparent to participate in those programs and achieve the positive effects we observed in the lab. Kathy Gunter is an associate professor of Exercise and Sport Science and Extension specialist with Extension Family & Community Health at Oregon State University. What do you hope is the outcome of your research? Are you working with anyone else in the CPPHS on this project? Click here to learn more from CPHHS researchers in these “Inside the mind of researcher” feature stories.